What a great way to reach your fitness goals with our friend and complete protein, the egg! Now, I have to be honest – I have never had a deviled egg in my life! 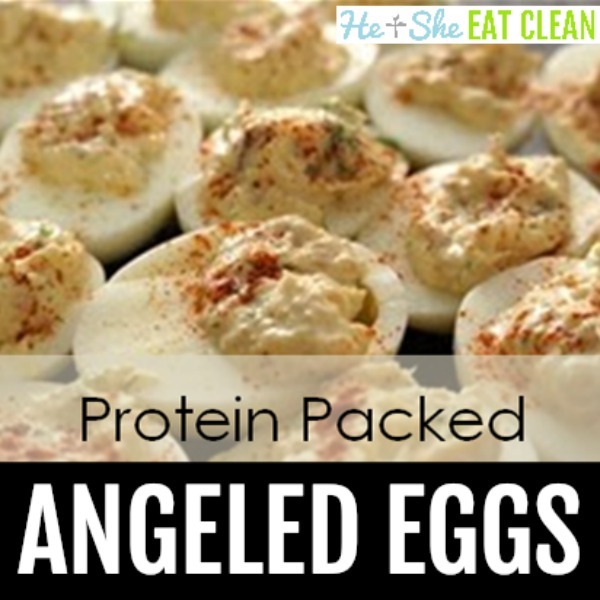 I was super excited to try this recipe for angeled eggs when I saw that it was clean and a great alternative to their higher fat, higher cholesterol evil cousin, the deviled egg. There is one caveat… my Father-in-Law, who is not used to eating anywhere near remotely clean, decided to try one and I don’t think that they were what he was expecting. There is definitely a different taste than that of a deviled egg! Worried? Try making a small batch before you plan to serve them just to make sure the family is up for it! Slice eggs into halves lengthwise. Scoop out yokes and set aside. In a medium-sized mixing bowl, finely mash 2 egg yolks with a fork. Discard remaining yolks. In another bowl, finely mash tuna with a fork. Combine tuna and egg yolks into one bowl. Add remaining ingredients and mix well. Spoon mixture into hollowed-out egg whites. Sprinkle with paprika. Serve immediately or chill to allow flavors to meld.